Business phrases have their place; that place is in the archives. Yet, many people speak as if they’ve swallowed the Business Jargon Dictionary. With so many conversations happening on social media, we need to know that not everyone is speaking in their mother-tongue. So, can we use plain English, please? I received an offensive automated DM (no, there weren’t any swear words, it was worse than that). To be clear, I objected to the word “synergy”. Couldn’t he have written, “how we can work together”? I can manage the project because social media is in my wheelhouse. The client would ask me, “What’s a wheelhouse?” And my client meeting would turn into an English class. I can manage the project because I’m good at social media. I implore you to reconsider how you write and speak. Always opt for plain English, so even non-native English speakers understand the point you’re making. Eric Jackson took a satirical view of the business phrases we should all avoid in his article: 89 Business Cliches That Will Get Any MBA Promoted And Make Them Totally Useless. Your ears will bleed, and you’ll find quite a few you use. The following infographic highlights the 10 phrases I never want to hear or be heard saying, and I invite you to publicly shame me if you ever see these words written by me. This word was misspelt. The writer meant to say drink the kool-aid. But did he want me to do that? “Drinking the Kool-Aid” is an idiom commonly used in the United States that refers to any person or group who knowingly goes along with a doomed or dangerous idea because of peer pressure. The phrase oftentimes carries a negative connotation when applied to an individual or group. Do you see how confusing it can be? We all try to get clever with our words but when we get too clever, we end up being unclear, and our message isn’t understood. We think outside the box here – We can come up with fresh ideas. That’s right in our wheelhouse – We have a lot of experience in this area. Don’t leave money on the table – Explore all options for making or saving money. Let’s circle back to that – We can discuss this in more detail later. I want you to run with this – I want you to manage this task/project. It’s a paradigm shift – Things have changed. We need to manage the optics of this – We need to make this look better. It is what it is – There’s nothing we can do. Don’t drink the Kool-Aid – Don’t be gullible. Impactful – Significant or relevant. 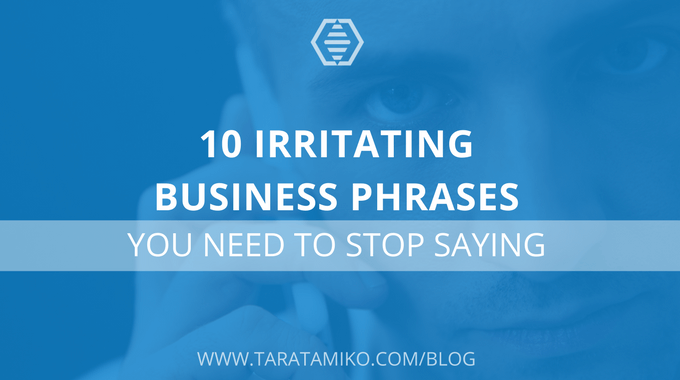 Do you use any of these phrases or do any of them make you cringe? Let me know in the comments. I’m afraid I’m guilty of saying “Don’t leave money on the table.” Oh dear. I absolutely detest “impactful,” and I’m growing to hate “thought leader,” mostly because nobody seems to know what it means. It’s one of those “Emperor’s New Clothes” phrases. I’ll be honest; I am also guilty of using some of these. Normally when I’m mirroring someone else’s language to make a connection. Love your reference to the Emperor’s New Clothing because it’s spot on!! I didn’t know about Kool-aid (I think it’s a soft drink?) but agree with your points in this article – thanks Tara! Yes, it’s a soft drink that was used to poison a group of people. Glad you enjoyed reading this. Do you have any phrases that drive you crazy? ???? See now, ‘managing the optics’ makes me think of opticians. It seems the business world likes to borrow phrases from the science world. ??? ?